Here is why at Rs. 19,999/-, Mi 4 Really Worth It !! Here's what you should consider, Mi4 16GB sells for RMB 1999 in China. This translates to roughly 19,700 Rupees. But then again, as buyers, we don't want to know how much a device costs somewhere else. We want to know if we are getting bang for buck and if Mi4 is as good a buying decision as Mi3 and the other phones in Redmi 1s are. I couldn't agree more. Buyers who are complaining about the price tag feel its overpriced. But let me tell you, once you get your hands on this device, your thinking would change instantly. I can go on and compare it to One plus or other flagship device. But that Would be injustice. One plus One is bulkier, screen is uglier and it can never match the premium feel of Mi4. And what can we say about MIUI, we all know its the most feature rich and customized android OS out there. And when you make such a sizeable investment on a smartphone, go for something that really is smart. Not stock. Sure MIUI consumes a lot of resources, but Mi4 with Snapdragon 801 SOC and 3 gigs of RAM would never disappoint you. And if you are stock or CyanogenMod fans, do remember that Xiaomi is releasing Kernel sources for its devices one by one and you would have your choice of custom ROMs. And for 20k of your money, you get a device that beats every other flagship on the market in Performance, features and design. Including top-notch hardware on the device is one thing, but putting it all together in a package that functions smoothly and works in harmony is another. Xiaomi has struck the right cords with Mi4. One of the First cameraphones to come with f1.8 aperture helping in low light photography, blazing fast 3G connectivity, 4K video recording, direct wired TV-Out. Excellent craftsmanship, great battery backup that would easily last you 9 hours of screentime. The only downside i can think of is limited storage at 16GB and Glossy white variant only. Storage problems could be overcome by the free cloud service that comes with MIUI or by using an OTG drive. As for the Glossy white back, order a custom back cover and make it sexier. A Micro SD card slot might have been handy though. The positives and negatives I have stated here are true to every word. Buying this device or not is your personal choice. But, if you are going for an upgrade or a new high-end flagship device, buying anything else would give you regrets. Once you actually use the device for some time, its clear that it's worth every penny invested. 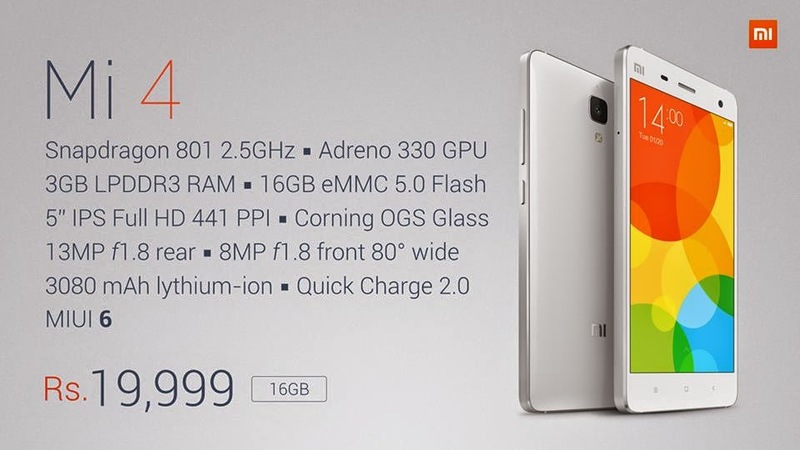 And seeing as Xiaomi is not charging more then the original price in China, its wrong to say this device is overpriced. If you cannot accept the 5$ difference in price between two countries, considering the logistics, shipping and processing charges, then you expect too much. So my suggestion to everyone reading, get it as soon as you can. In the first sale if possible. We all know how the situation with Xiaomi devices gets in India. Some of us even wind up paying extra to resellers. Once people get their hands on the mi4 and reviews start coming out, it would be hard to get your hands on the device. It is worth every single rupee. But then again, everyone is entitled to their own opinion and you dont have to agree with me. And if you hate Xiaomi or feel its overpriced, I feel sorry you would miss it.